Install the battery according to your motorcycle manufacturer’s instructions. Step 1: Connect the battery terminal with the motorcycle’s wiring: Red cable connects to the positive terminal, Black cable connects to the negative terminal. Then start the motorcycle. 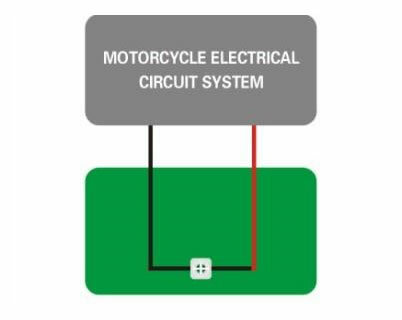 Step 2: Connect a voltmeter to the motorcycle’s cables. Red cable connects to positive, Black cable connects to negative. The tester will indicate the battery open circuit voltage. Step 3: Disconnect positive battery terminal from the motorcycle. 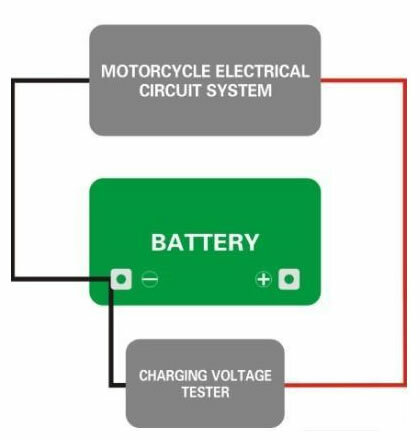 The tester will now indicate the motorcycle output charging voltage; the charging voltage is ok providing it is between 14V and 15V. The battery will not fully charge if the charging voltage is less than 14V, and the battery can be overcharged if the voltage is above 15V. Either circumstance can damage the battery. 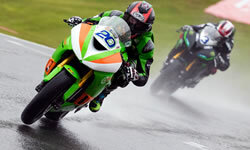 This test should be repeated at 2,000 and 5,000 RPM. 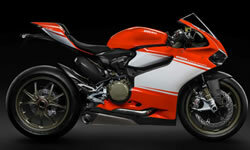 Step 4: Stall the motorcycle and take out the key. 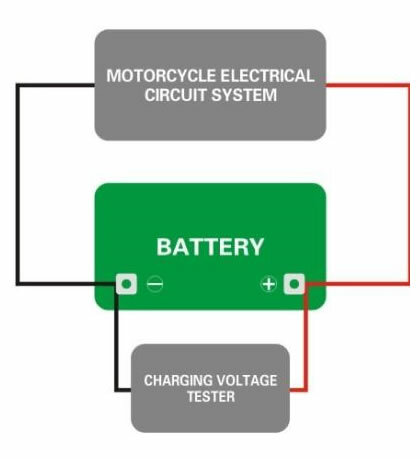 Connect the multimeter (milliamperes function) between battery and motorcycle cable (either positive or negative terminal) in series. Then check the motorcycle power consumption in milliamps to make sure the current drain is less than 1mA during motorcycle stall. Step 5: If the motorcycle passes the above test, the Skyrich engine starts lithium battery can be installed on the motorcycle. Make sure that the battery space is clear of any potentially damaging debris and moisture. Ensure that the cables are correctly insulted, no cracks or splits, and that the terminals have been correctly fitted with no hanging cable filaments. When attaching the cables to the battery make sure that the cables and terminals are not stressed and that the cables are not too tight. The recommended maximum torque setting for when connecting the cables is 3Nm. Please note that the battery can be installed upright or on its side/back if that helps with the installation. 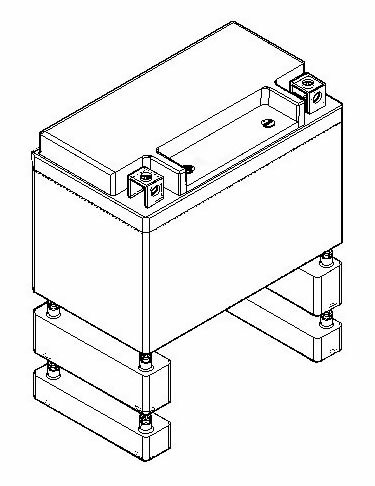 To prevent the battery leads from flexing and stressing the terminals, the leads should be adequately supported, but without adding tension that might stress the terminals. To protect the battery from excessive shock and vibration caused by the rigours of both road and track driving, vibration damping foam (closed cell flame-retardant) should be placed between the battery casing and any metal or carbon fibre surface. 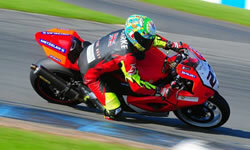 Choose correct corresponding Skyrich battery accordingly to motorcycle model or lead acid model. Check the battery voltage before installation, please recharge the battery first if the battery voltage is less than 12.4V (follow the charging instructions). Take out the lead acid battery according to your manufactures instructions, please make sure you disconnect the negative screw and cable, then positive, to avoid a short circuit. Compare original battery and lithium ion battery. First, check the battery polarity; the two batteries should be the same. Then check the batteries’ dimensions; length, width and height. Normally, our lithium ion battery will be same size as original battery or smaller, you can install the battery directly if same dimensions. If smaller dimension, we offer following two methods to adjust the battery size. 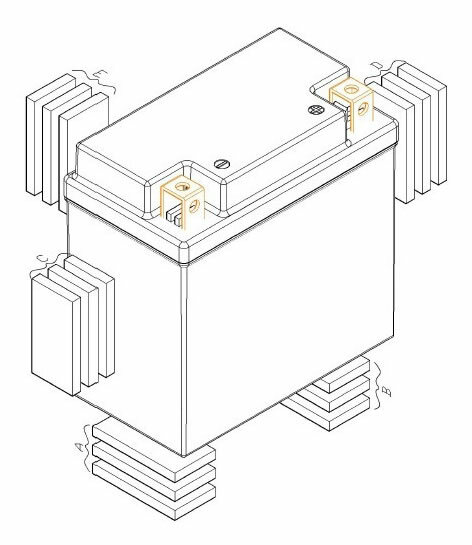 Method 1: When the lithium ion battery is lower than the original battery, we provide spacers with the batteries. You can install one or more spacers at the bottom of the battery to change the height as required (see picture). Please make sure the motorcycles positive and negative cables connect to the battery terminals correctly. Positive first, then negative, to avoid short circuit. Electrolyte inside the battery is harmful to the skin and eyes. If the battery leaks avoid contact with the electrolyte. Should electrolyte get in your eyes, do not rub them, instead, rinse them with clean running water and immediately seek medical attention. If left untreated, electrolyte can cause eye permanent injury.